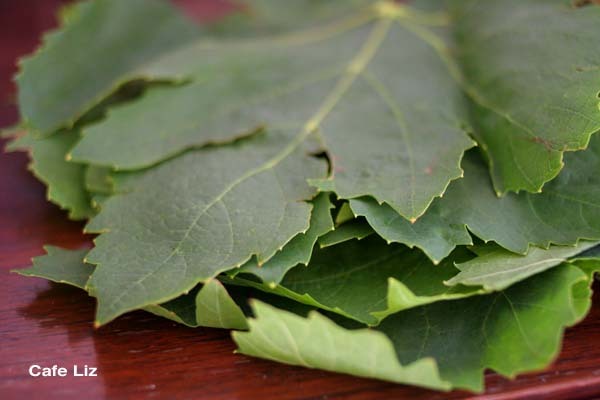 Now is the season to pick grape leaves. Not that I have access to a grapevine; but plenty of other people do, it seems. One of them apparently dumped a pile of fresh leaves next to the scales at some stall buried deep in the Carmel market this past weekend. Now, stuffed grape leaves take a lot of time to prepare, and I didn’t really think I’d have that much time this week, but what can I say? 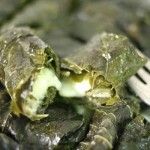 I was intrigued, since I’ve never worked with fresh grape leaves before, only pickled ones. As it turns out, there’s not much of a difference between fresh and pickled, especially not once they’ve been cooked for a very, very long time. This very long cooking is crucial, since many a stuffed grape leaf has failed me by coming out too tough to chew after only, say, an hour on the stovetop. But this time around, I figured out a new and improved way to make my grape leaves perfectly tender: the pressure cooker. For me, the pressure cooker is a godsend. I’m impatient, plus I don’t usually have several hours to sit at home and watch some dish cook, so I appreciate how it cuts cooking time by two-thirds. The pressure-cooker grape-leaf union wasn’t a predetermined success, since grape leaves can burn, but it seems the low flame that you use with a pressure cooker suited them just fine. If you don’t have a pressure cooker, then you’ll just have to spend 1 1/2 hours cooking your stuffed grape leaves on a low flame. But that’s OK. They’re worth the effort. 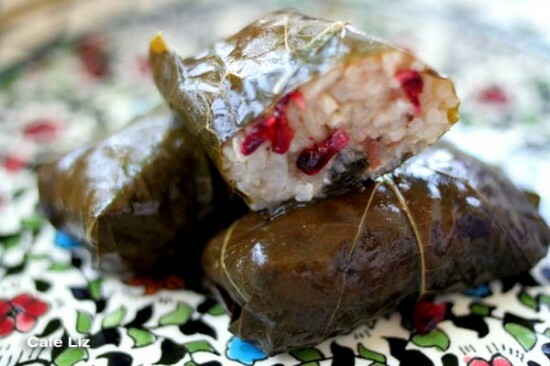 This recipe makes about 30-35 stuffed grape leaf rolls. 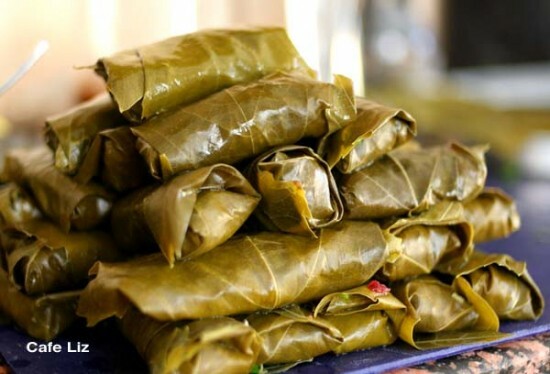 Grape leaves are sold by weight — they’re currently going for between 20 and 25 shekels a kilo — so you’ll need around 200 grams, either fresh (as in the photo) or pickled. It’s about the same quantity either way. This should give you plenty to fill, plus extras to line the bottom of the pot. Despite my initial curiosity over the fresh grape leaves, I actually preferred the pickled ones, mostly because they already had a light, vinegary seasoning. Although as I’ve already mentioned, once you’ve cooked them for upwards of an hour wrapped around seasoned rice, it really doesn’t make that much of a difference. For my stuffing, I used rice seasoned with fresh garlic, dried cranberries and parsley. This part is wide open for variation — the most important step in good-tasting stuffed grape leaves is properly rolling and cooking them. Once you’ve gotten that down, you can flavor the rice pretty much however you want. Mint, cilantro, chives, pine nuts, almonds, cardamom, cloves — there are plenty of other seasonings you could try. Mix the rice with the cranberries, parsley, garlic, salt, spices, olive oil, lemon zest and half the lemon juice (basically, everything but the grape leaves and half the lemon juice). Rinse the grape leaves and boil in a pot for a few minutes. Drain and rinse under cold water until they’re cool enough to handle. 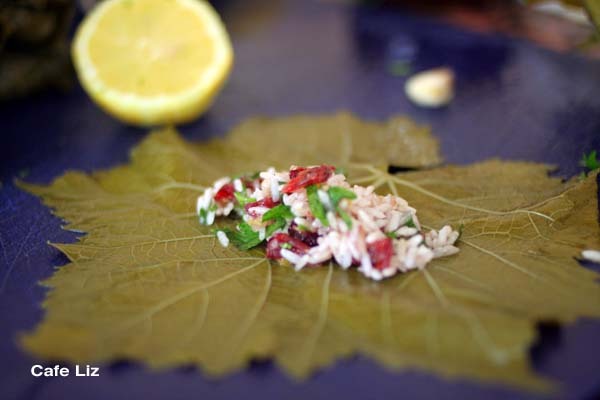 To roll the grape leaves, take a leaf and place it bottom-side up in front of you, with the side that was attached to the stem farthest away from you. 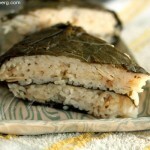 Put about a tablespoon of rice filling in the middle of the leaf, close to where the stem was. See the photo? That tiny spot of filling in the middle of the big leaf? That’s all the filling you need; the rice will expand. Fold the top of the leaf over the filling. Then fold in the sides. Now, tightly roll up the leaf, down to the tip, folding any bits that stick out the sides into your roll. Repeat until the filling is used up. Line the base of your pressure cooker with leftover leaves — those that were too ripped to use, etc. You’ll want a few layers, just to make sure the stuffed leaves don’t stick to the pot and burn. Some recipes call for a layer of stale bread underneath the leaves, but I didn’t find this necessary. 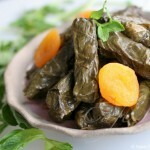 If you’re using a regular pot, cook the stuffed grape leaves on a low flame for about 1 1/2 hours, until they’re tender. If you’re using a pressure cooker, bring it up to pressure, let it cook on a very low flame for 30 minutes, and then let depressurize. 5 Responses to "Grape leaves stuffed with cranberries, garlic and rice"
This is a delicious dish! And the photos you got of it are among your best ever, I think!